After a joint welcome with Dom Pates from City, Jisc’s James Clay gave an introduction to the Intelligent Campus, explaining where the project came from, what we were doing and where we intended to go. One of the things that James explained was the difference between a smart campus and an intelligent campus. This is explained more in this article written by James for Educational Technology. We then moved into a panel session with key stakeholders across City, including representatives from the Student’s Union, educational technologists, teaching and learning and IT. They were challenged to think about their three priorities in relation to the Intelligent Campus and this created an interesting discussion as well as diverse and different viewpoints. The audience contributed by posting questions online. 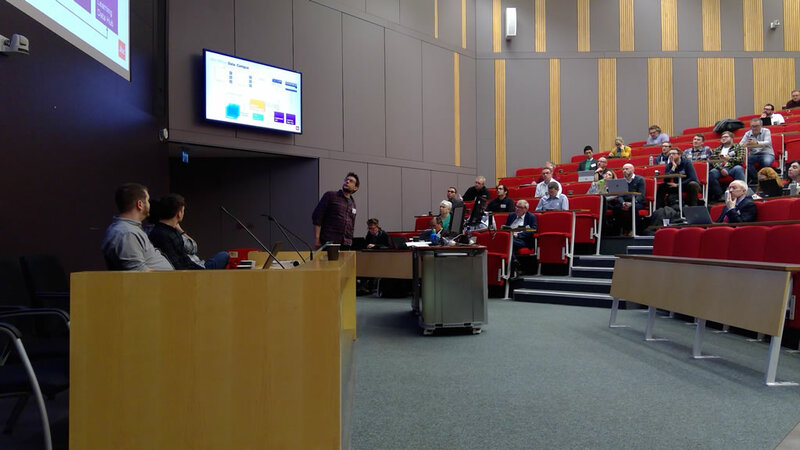 After a delayed break (where was the coffee) we moved onto a technical update from the technical team at Jisc. Michael Webb described the background to the technical work and how it fitted and is derived from the work Jisc have been doing in learning analytics. This was followed by an overview from Peter Cliff about the prototype that Jisc have been building that uses data from sensors in the offices in Jisc, but allows sensors to be used from any company, there is no vendor lock-in. 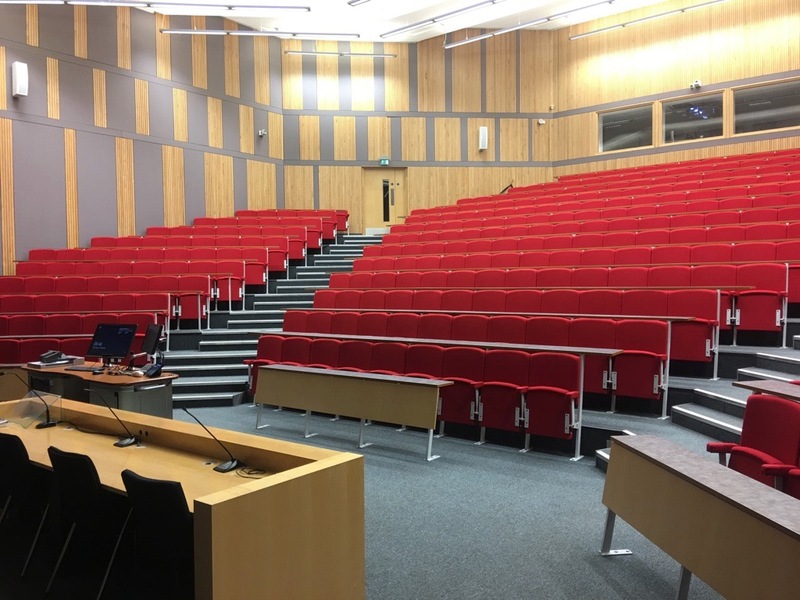 It was then followed by a live demo from Geoff Hoyle who explained how we could add rooms to the prototype dashboard and utilised live data from a sensor which had been running in the Oliver Thompson Lecture Theatre all that morning. Lunch gave an opportunity for delegates to network and discuss the day so far. After lunch, Robin Ghurbhurun, the Chief Executive and Principal of Richmond upon Thames College gave us an insight to the college’s future with their new Richmond Building. We then had a session from Siemens about their products in this space, notably Mindsphere. Something we want to do in these community events, is provide a platform for vendors to talk about their work in this space and what technologies they are working on. One slide caught many people’s attention about the impact of CO2 levels in buildings. We were then treated to a video about the Lysgården building in Trondheim in Norway. This smart (or even intelligent building) explores how sensors and data can improve the working lives of those who work in it. We stopped for afternoon tea and then it was onto a large group activity thinking about the actual space we had been in all day. This was an excellent session run by Dom Pates, Shelia Egan and Sarah Muller. In this session delegates were asked what they liked about the space and what they didn’t like. It was an energetic and lively session and helped finish the day on a real high. Before James closed the day, he briefly touched on some of the legal and ethical work that Jisc are undertaking in the Intelligent Campus space. Andrew Cormack, Jisc’s Chief Regulatory Adviser has been working on a Data Protection Impact Assessment Toolkit for the Intelligent Campus. This is a draft of a Toolkit for applying Data Protection Impact Assessments to Intelligent Campus applications. This has been derived from an RFID Toolkit approved by European Regulators in 2011, with input from other experts within Jisc. From some of the initial feedback, many delegates had a good day. That was it that was the day over. The next community event is scheduled for Birmingham in May.